Hi! 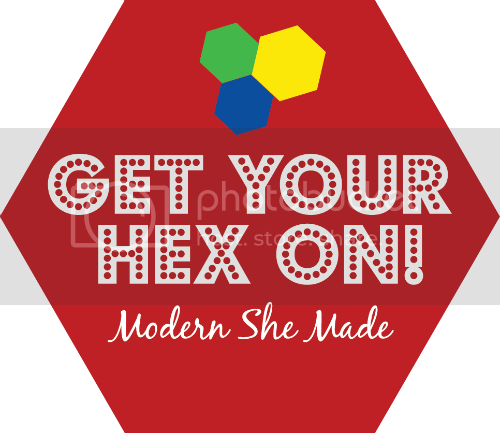 Have you heard of the Modern She Made Swap? We are in round 4 and this season the shape we are required to utilize was a hexagon. Honestly, hexagons are not my favorite, but that was what the majority wanted so I dove in. First of all, let me tell you a little story. 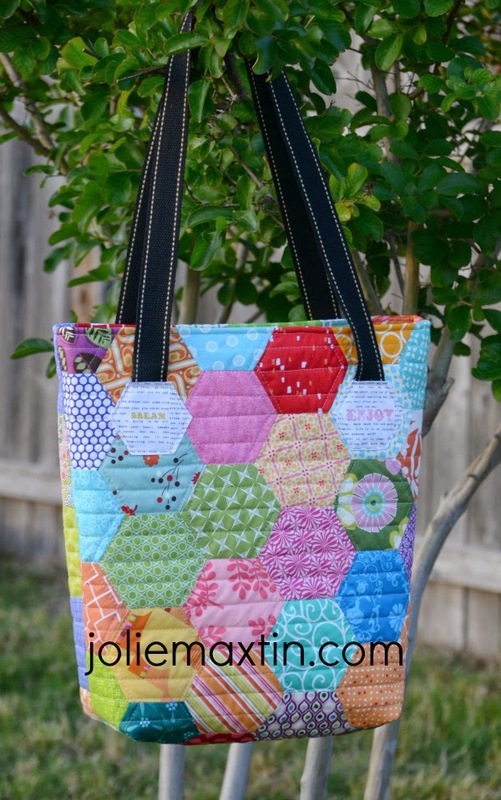 I have sewn a few hexagons before and it really wasn't that bad for me, so truthfully, I wasn't sure what I was getting myself into. In this swap, we post mosaics to assist our partners in communicating our tastes, styles and some inspiration of something we would like. My partner posted a bag, very similar to this one. Low and behold, there was a tutorial all written up for it too. Bingo - easy choice (or so I thought). 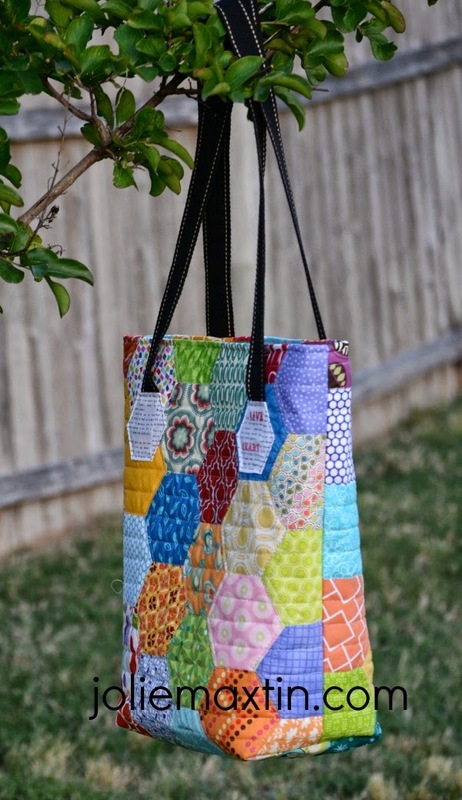 Lori wrote up this tutorial and she and I originally started the Modern She Made swap so it was with true respect that I used her tutorial to make this bag. Funny thing though, the pattern started with "Start by piecing your hexagons....." Little did I know that this would take me almost a month. I had to cut them out, baste them, sew them in rows and then sew the rows to each other. Mr. Maxtin said to me, when I was close to done "I wondered when you were going to realize that you had to sew every one of them to each other" and then we laughed. It wasn't that I didn't know, but that wasn't part of my thought process....yeah, it's funny now though. 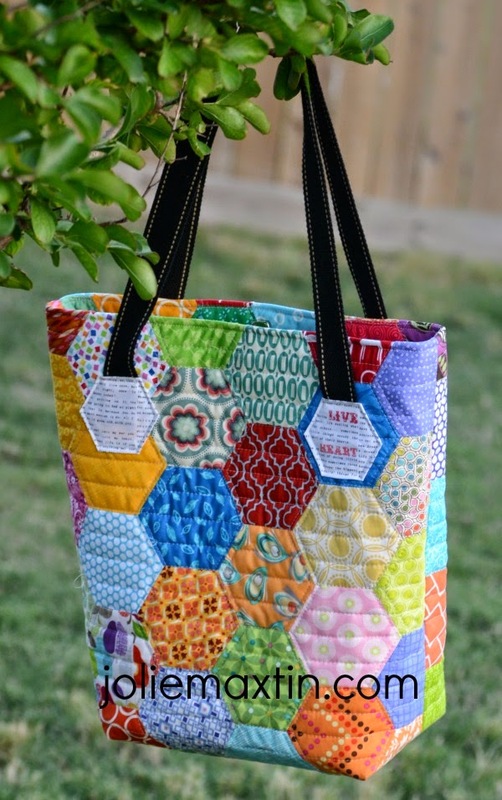 Anyway....so 76 hexagons, and who knows how many hours later, I hope my partner (who doesn't even know who she is yet) really loves this bag because I spent hours and hours on it. I did my first internal zip pocket and installed my first magnetic snap. There aren't nearly as many swaps on flickr anymore, which is where I was most active and I miss it. The swaps I have been in make me do things I would never do, and have the courage to try new things....like magnetic snaps! Partner, enjoy this bag! That is a gorgeous bag! Congratulations! I am sure it will be a great success! And thanks for the tutorial link! I'm so bummed I couldn't participate this round. The first three rounds were awesome. This bag turned out awesome.